In the autumn of 2001, we decided to stage an unorthodox art show in our hometown of Newburyport, Massachusetts. The concept was simple: We asked all the artists (and some non-artists) that we knew to contribute fifty pieces of art to be given away anonymously in December. Some artists gave us fifty unique pieces, others made prints or photocopies. The artists gathered over pizza at the end of November and stamped “FREE ART” on over 1000 pieces of artwork. We made some sturdy boxes, and labeled them “FREE ART: TAKE ONE”, and filled them with the art. On December 1st, we hung the boxes up around downtown Newburyport in various stores and public places, where they were picked through and emptied out over the course of the holiday season. It felt great to be able to give away so much art at a time of year when there is such a focus on commercialism. Much of the art was unsigned, anonymous. There was no explanation of the show on the boxes, no websites for more information. The artists wouldn’t know who ended up with their art. The people who took the art wouldn’t know who made it. It was a pure act of creation and giving. The following year, we decided to stage the Free Art Show again. And again the next year. Now in it’s tenth year, we have seen little variance from the original concept. At one point, we lowered the number of pieces artists had to contribute from fifty to thirty, to try to encourage more people to participate. And over the years, we added more cities where the boxes would be hung. Portsmouth, NH; Portland, ME; Biddeford, ME; and Brooklyn, NY have all seen the spray-painted cardboard FREE ART boxes. Scores of artists have contributed. Many participate each year, and there are always some new faces. The idea is a simple one, and we’d like to encourage people all over the world to stage Free Art Shows in their communities. The first decade has been incredibly gratifying, and I hope it will continue on for many more years. 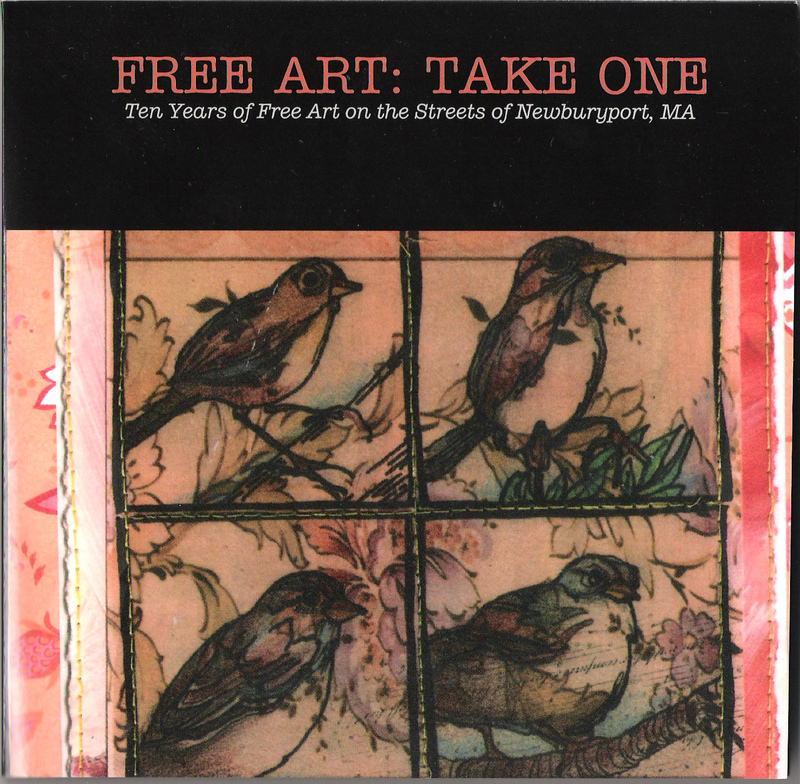 This book collects an assortment of artwork from 2001 to 2009, presented anonymously, in the spirit of the Free Art Show.